Built in 1946, the 12-unit, buff-brick motel in Villa Ridge, Missouri, served Route 66 travelers, and later traffic from the intestate. Image courtesy Jim Thole. The first thing you see is the sun--a multi-rayed orb sinking into inky blue water. 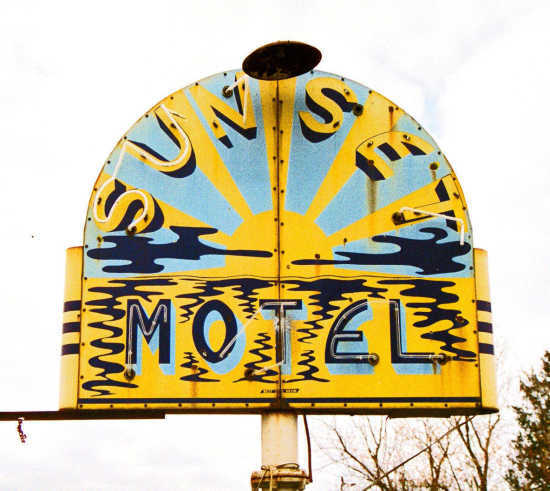 The stunning porcelain neon sign advertising the Sunset Motel, now apartments in the tiny town of Villa Ridge in eastern Missouri, will be restored as part of a Route 66 Corridor Preservation Program cost-share grant. Built in 1946 by the Lovelace family, the 12-unit, buff-brick motel is shaped like a V; every room faces lawn instead of parking. The Sunset served travelers on Route 66, and later the interstate, until the 1990s. Fresh from their success restoring the Donut Drive-in sign in St. Louis, the Missouri Route 66 Association worked with the motel owner to apply for a cost-share grant. With the grant, the team that restored the St. Louis sign will refurbish the Sunset Motel sign, installing new neon tubing and bringing back the luster of its setting sun. The owner, using grant monies, will reroof the motel and refurbish dormers, cornice, fascia and soffits. Fiery orange neon will again outline its gables. Look for the sun not to set on this historic motel.